relationship I have with a few pieces of gear. I realized they are constant in my life, in fact the most constant physical presence. I’ve left a long trail of great friends strewn across the world. It’s a beautiful thing, to have connected so deeply with so many people from various cultures and backgrounds. But as I shift from one place to the next they are with me in only memories and hopes of future meetings. they are a constant in the storm. A dufflebag. Patagonia’s black hole 120L contains everything I hold dear. My companions stuffed inside awaiting the next adventure. I’m going to start writing about some of these clutch items that have been with me for while. A basic item, a simple use. Keep liquid warm. How could such a simple product hold an endearing place in my heart? Just look at it! Battered and dented, like a warship after a battle. It’s been with me four years. Gone well beyond keeping drinks and soups warm. It’s been lost and then found, used in self defense, dropped off a chairlift, brought smiles to people’s faces and gotten me free coffee. Beyond that when I need it most it’s a giver of life. Reaching into the cold pack for some much needed hot chocolate on a lonely mountain side, a midday coffee on a long ride, even hot pineapple juice from a Nepali guide. There is something immensely rejuvenating having a warm drink on a frigid adventure, perhaps it’s purely psychological. But those are always the toughest challenges, the mental ones. 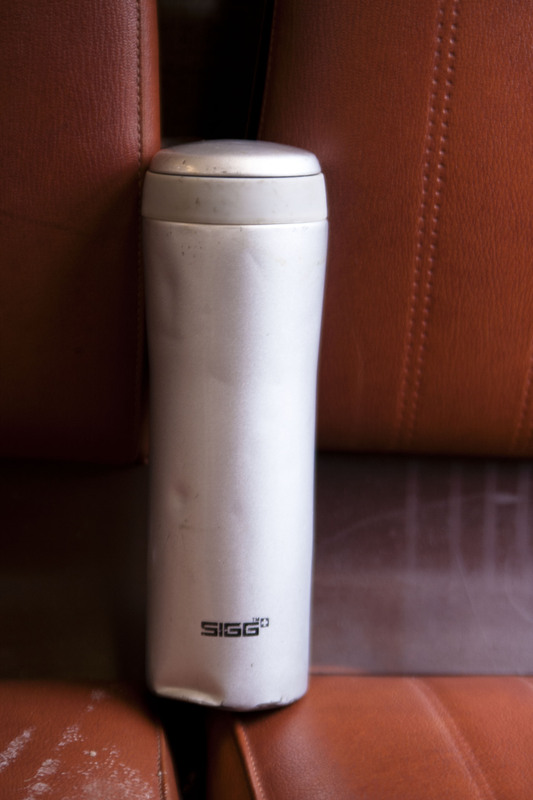 Sigg metro mug. Four years, lots of dents, never a leak. Highly recommended. David- I remember the Christmas that your Dad and I gave you this best friend. So glad it has a companion for these years. well, I have a sigg too and it’s amazing a real timeless item!